International Women’s Day celebrates the amazing women who have made a real impact on the world we live in today. To honour this occasion, McDonald's have flipped their famous golden arches upside down to represent a ‘W’ for women and to show the sky has no limits when it comes to gender, British Airways are operating all female crew flights. 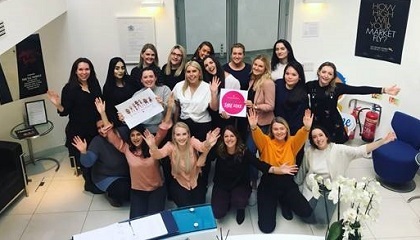 TLC Marketing has also been busy celebrating this special occasion, starting the day by surprising all its female staff with a cupcake accompanied by an inspirational quote. With a ‘women only' playlist on repeat throughout the day, all ladies were later treated to a sit-down lunch (Nandos of course) and during this time, reflected on the past, present and future of women all around the world. We wanted to find out what the wonderful women at TLC Marketing had to say about the importance of International Women’s Day. Why do you think it’s important to celebrate International Women’s Day? I’m a huge believer in women lifting other women up and this is a day dedicated to doing just that. It’s a chance to reflect on brilliant women throughout history, and to simply celebrate our power and strength. What advice do you have for the young girls of today? Be yourself. What the world needs now more than ever is for women to use the female spirit for positive change. Embody that spirit, whatever that means to you. Don’t reign it in. Malala Yousafzai, because we should be looking to the youth for inspiration. They have so much to teach us. International Women’s Day gives us the voice to celebrate all of the amazing women in this world. Today gives us a platform to be able to look forward, and also remember the struggle that women faced throughout the centuries in gaining basic rights, rights that many women still have to fight for. The fight for equality is only just beginning – whether in the workplace, the home or on the streets. Women face barriers in realising their potential, meaning we miss out on all they can offer. In so many industries, women are still undervalued and underestimated. Today is about shouting about our achievements and taking the credit we deserve. In a world where women face such inequality, (with the gender pay gap being a prominent discussion in the news recently) it's important to celebrate how wonderful women are and how much we contribute to society and life in general. Be yourself and don’t worry about things you can’t control. For one, I believe it’s important to celebrate International Women's Day because women in history have worked and sacrificed so much to fight for the rights and respect we have now. It’s a day to fully embrace all of us, no matter what our differences. It’s a day to really pat yourself and each other on the back and recognise how far we’ve come along and acknowledge how much further we can go, together. To celebrate the achievements of women around the world - past, present and future.